The two boxes full of squillions have landed in Catifornia! Mum sent them to Moki's beans so they can use them to help raise funds for Moki's treatments. 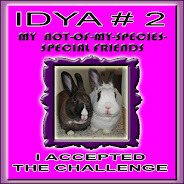 So stay tuned...will let you know when they are ready for adoption. If he is comic, it is only because of the incongruity of so demure a look and so wild a heart. - Alan Devoe. Hope everycat had a good weekend. I had a nice quiet time for the most part. After mum got rid of the invasion of the squillions, she worked to make the place clean. So now I have to work to put my furs back on stuff. One of the things mum had to do was find stuff to fill the cold box. Look how empty it is! This is not acceptable to have this so empty. I know you don't have my food in here, but if this is empty then you can't share your food with me! This can't wait until Flower Friday, mum finally got one of her flowers to actually flower! This is the flower bud not quite ready to open. But on Sunday morning mum went outside to pick up the paper she could say, "Good morning, Morning Glory". Mum went into all of her hidey spots and brought out lots of bags of stuff. Then she took all of the stuff out of the bags and put them on the table. I have been invaded by mini-Squillions! Look there are sooooooo many of them. I can't count that high, I don't have enough paws! Goodness, we have gingers, tuxies, meezers, torties and grey's. Sitting up and laying down ones. Look at all of the bags they were in and I decided that was a good spot to take a short nap. But then mum starting taking the bags, wrapping each and every little squllion into a cushion and putting them in a box. The table is less crowded now, but still more to get wrapped up. The box is full and all stuff with cushioning material so they don't get bumped around. But if that box is full, what about these guys? Ah, mum is smart she had another box. Plus some other bigger things to put inside the second box. So here are the two boxes ready to go to the station. Mum is sending them off to a special place so they can help raise green papers to help out a kittie. We will tell you what kittie will be helped, once the boxes reach their destination. In other news I won KC's contest to name the newest member of the household. Go say hi to Socket SweetFeets Sherwood! Ahhhh, we have had great weather so the windows have been open. I can sit in the window and watch and listen to the birdies. Sometimes the buns and squirrels come by to entertain me as well. What is also cool is the fireflies. Just as the sun starts going down, they wake up and start flying around. It is so cool to see them flitting around. One of our many types of daylillies. This one is dark red. It is getting now so the flowers that bloom in the late summer are opening and making the garden pretty. Since mum is the purson who takes the pictures, she isn't in them! But last week she came home and put this on the front of cold box. It does look like her. She got it when her company had a picnic. They had a guy who would do pictures of people. It is her! It really looks like her! Plus she came home with stuff, one a prize for winning at bingo! The other a blankie for just showing up. As I said on Monday mum is on my short list for ignoring or forgetting me. Last Saturday after she went out to eat with Miss Lynn she came home, did a few things and went to bed. She forgot to feed me and clean my box. So William was partially correct, she forgot to feed me. So very early Sunday morning I started jumping on the bed, getting on her feets, knocked a fake plant on the floor. Just generally made myself noticeable, nothing got her out of bed early. Once she did get up and walked into the kitchen she immediately noticed my VERY empty bowl and put crunchies in in immediately. She 'pologized but that didn't make it right. My little tummy was rumbling. Then she went down to wash all her clothes and finally cleared the box out too. Thanks, it really needed that, plus a refill on the litter. Never try to out stubborn a cat. - Robert A. Heinlein I am not happy with mum, so she gets to see my backside for the most part. Her actions to me over the weekend were not acceptable. I am doing my best to ignore her or put the bitey on her. There was a linky on the CB the other day to a guy singing this song to some puppies to make them go to sleep. It worked! And you'll be going, you know how I hate to see you go. Mum sings this, at least the refrain part, to me a lot too when it gets to be bed time. 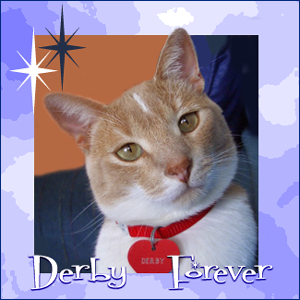 If fits me well as I am "Derby Sweetheart Cat" to my lovely ladycat Ms Princess Mia Bella. I don't always fall asleep, but mum does! She sings herself to sleep. Plus you can check out the original way this was sung so many years ago. It was sung by The Spaniels, maybe that is why it was so good to put puppies to sleep. I know other people sang it too. Mum and Grampie finished up the metal monster room project today. Mum is happy and so am I, less noise from out there to disturb my naps. Plus mum pulled out some of the left over roast beast for their lunch. I got some too. Now mum is off to have dinner with Miss Lynn, I hope she brings home some good stuff to eat. Woohoo, the weekend is almost here. I know mum will be around this weekend, she and Grampie have to work on the stuff in the metal monster room. I saw this on Max, The Pyschokitty blog. A site that will donate kibble to shelters. All our beans have to do is answer the question. Actually it will donate if you get it right or wrong. Mum takes the quiz at home and also at work. That way we can double our donation. So go out and take the trivia challenge every day and help out shelter kitties so that they can be fed properly. A sunny flower that the birdies or squirrels must have planted from the feeders. In time the flower will feed the birdies again. Me I will just hang out in one of my tents. Happy weekend one and all. This is Smokey, the woofie of one of mum's furiends. He does the Q very nicely. Here he is at his house looking out the windows that go to the floor. I don't do the Q, and mum hasn't gotten a picture of me doing the full monty. So not sure if I will be able to enter the contest. I have just been chillaxin on my bed. Glad you like my voice, I understand I have gotten a few of the ladycats all excited when listening to my voice. MEORRWWWW to all of you. This is me just all stretched out on the coffee table in front of mum. She was probably furry busy on the puter or reading the newsy paper or whatever else she does that keeps her so busy. Me I just crash wherever and whenever I can. Mum left me on my own this weekend for the most part. She was off being busy with some of her friends. Glad you like to hear my real, very own meows. If you didn't hear them yet see the post before! Mum managed to record me talking! Yes my real life meows and merfs. The first one she is getting ready to make foods for dinner. So I am asking for something to eat. I am usually also rubbing around her feets too! This is the picture that she took just before she recorded the sound. Pardon some of the extra noises, you can even hear the floor creak! The second one, this is my love voice. When mum hears this she knows I am the love bug mode. Give me pets, scritches and a whole lot of attention. I want some of that food you have up there lady! So now you know what I really sound like! Mum discovered/remembered that her camera, if you push a button will record noise for 30 seconds after a picture is taken. You just have to remember to push the button. Mu Shue is still with us for now, guess his mum said he was feeling better, so he hasn't gotten to the bridge just yet. This week we are losing another of our blogging buddies, Mu shue. He was a senior catizen and had some health issues. He will be helped to The Bridge today. Even with this he was a hero when a fire happened in the apartment back in April, he guided his sisfurs, Lily and Iris, to safety. Go in peace my friend. A flower for you. A pink lilly. I got tagged for the cold box meme by Mindy and Moe, Team Tabby. "A fun and simple MEME for the hot summer. Show us a photo of the front of your Cold Box and tell us about at least one thing on it and one thing you keep inside of it! Tag your friends and remember to stay COOL!" Well mum has lots of magnets of places she has been or of works of art she wishes she could own, but could never afford to buy. You can biggify any picture to get a better look. Magnets too about the Squillions and the Cat Olympics that we had! A good looking ginger cat as well. Could that be me? Some sticky things that are of kitties too. Inside, well the freezy part has ice cream cones! Chicken and not yet roasted beast! In the bottom, the just cold spot, the lower shelf, the box with the red lid on the left. That is the remaining roast beast from the other day! I tag anyone and everyone who wants to play along! Mum got this real thick envelope the other day. She said it was for a wedding! Mum smooshed out the last names on this to protect the innocent. Is that Sanjee getting married mum? It looks like her name? No, mum says that is Sajeev and that is the groom. Also notice it says Mrs and Mr So-N-So, unlike here where the names are Mr and Mrs Such-N-Such. These names of the towns are so much different that I have seen, this must be a fancy place to have such a loooooong name. Cool, can we go? Mum said no. No?! Why? It is half way around th world! We live in the USofA in Whiskerconsin. The wedding is in Kerala, a State in the Republic of India, which is on the lower west coast of India. Goodness who do you know that lives in India that would invite you to a wedding? I know you used to talk to people on the other side of the world for your work, it isn't one of them, is it? No? Oh, it is her nephew's wife's, sister that is the bride. She met her and the rest of the family when the nephew got married three years ago. The bride and groom live here in the US, but his family still lives in Kerala, which is where the bride's family is originally from. Her parents actually live in Botswana, which is in Africa. Whew, I don't think I can keep this all straight. Oh there is a party to cellybrate the wedding later in the US, but going to either of these would cost lots of green papers. Really lots of green papers if she had to go to India. Hey, that was just before I came to live with you, right? Right! She postponed adopting a kittie so she could go to the wedding. I can rest easy now, mum won't be taking off to visit the other side of the world. No respect, I get no respect. Well, that isn't really true, but that is what Rodney would have said. I guess I do get some respect, KellyCat honored me with this award. Arte y Pico, I think that is in a language I don't know, so I really don't know what it means. This award was created to be given to bloggers who inspire others with their creativity and their talents, also for contributing to the blogging world in whatever medium.When you receive this award it is considered a "special honor". Once you have received this award, you are to pass it on to 5 others." What a wonderful way to show some love and appreciation to your fellow bloggers!!! OK so here is my five of the kitties blogs who have inspired me to get started doing my blog. I just report on my humble little life on what is happening in my little corner of the world. I was helpful to mum when she brought the flag inside to put it away at night. I wanted to play on it, but mum said that was disrespectful to play on the flag. So she had me not play or nap on the flag and put it safely away. Mum cooked outside lots this weekend. The sausages, or bratwurst as mum calls them, on July4. But then Sunday she took some meat out of the freezer to cook. Now that might not look like much but that is a HUGE piece of roasting beast. How big you ask? Well look how much room it took up on the plate. It is also about 3 inches thick! Mum cut only some of this off to eat last night, she didn't eat the whole thing! But she did share with me, a few little pieces of the delicious, medium rare, tenderloin. There I am getting ready to snarf down the piece that mum gave me to start with. Below is her plate of foods. Roast beast, grapes and cauly flowers. Sorry Sammy, Miles and Billy Meezer, mum did share her nice foods with me. Sorry your beans didn't share with you. Plus mum did NOT manage to set off the smoke thingy this time. Usually she is good and does not set it off, it was just last week and the wind was just right, and just enough smoke from the outside cooking spot.